A European team of astronomers have used the new GRAVITY instrument at ESO’s Very Large Telescope to obtain exciting observations of the centre of the Milky Way by combining light from all four of the 8.2-metre Unit Telescopes for the first time. These results provide a taste of the groundbreaking science that GRAVITY will produce as it probes the extremely strong gravitational fields close to the central supermassive black hole and tests Einstein’s general relativity. The GRAVITY instrument is now operating with the four 8.2-metre Unit Telescopes of ESO’s Very Large Telescope (VLT), and even from early test results it is already clear that it will soon be producing world-class science. GRAVITY is part of the VLT Interferometer. By combining light from the four telescopes it can achieve the same spatial resolution and precision in measuring positions as a telescope of up to 130 metres in diameter. The corresponding gains in resolving power and positional accuracy — a factor of 15 over the individual 8.2-metre VLT Unit Telescopes — will enable GRAVITY to make amazingly accurate measurements of astronomical objects. One of GRAVITY’s primary goals is to make detailed observations of the surroundings of the 4 million solar mass black hole at the very centre of the Milky Way . Although the position and mass of the black hole have been known since 2002, by making precision measurements of the motions of stars orbiting it, GRAVITY will allow astronomers to probe the gravitational field around the black hole in unprecedented detail, providing a unique test of Einstein’s general theory of relativity. In this regard, the first observations with GRAVITY are already very exciting. 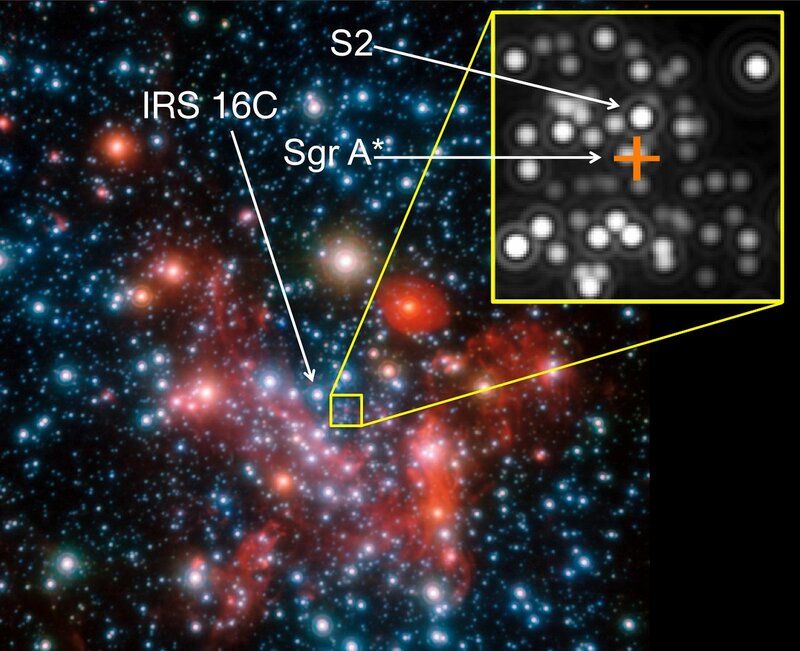 The GRAVITY team  has used the instrument to observe a star known as S2 as it orbits the black hole at the centre of our galaxy with a period of only 16 years. These tests have impressively demonstrated GRAVITY’s sensitivity as it was able to see this faint star in just a few minutes of observation. The team will soon be able to obtain ultra-precise positions of the orbiting star, equivalent to measuring the position of an object on the Moon with centimetre precision. That will enable them to determine whether the motion around the black hole follows the predictions of Einstein’s general relativity — or not. The new observations show that the Galactic Centre is as ideal a laboratory as one can hope for. "It was a fantastic moment for the whole team when the light from the star interfered for the first time — after eight years of hard work," says GRAVITY’s lead scientist Frank Eisenhauer from the Max Planck Institute for Extraterrestrial Physics in Garching, Germany. "First we actively stabilised the interference on a bright nearby star, and then only a few minutes later we could really see the interference from the faint star — to a lot of high-fives.” At first glance neither the reference star nor the orbiting star have massive companions that would complicate the observations and analysis. "They are ideal probes," explains Eisenhauer. This early indication of success does not come a moment too soon. In 2018 the S2 star will be at its closest to the black hole, just 17 light-hours away from it and travelling at almost 30 million kilometres per hour, or 2.5% of the speed of light. At this distance the effects due to general relativity will be most pronounced and GRAVITY observations will yield their most important results . This opportunity will not be repeated for another 16 years. The centre of the Milky Way, our home galaxy, lies on the sky in the constellation of Sagittarius (The Archer) and is some 25 000 light-years distant from Earth. The GRAVITY consortium consists of: the Max Planck Institutes for Extraterrestrial Physics (MPE) and Astronomy (MPIA), LESIA of Paris Observatory and IPAG of Université Grenoble Alpes/CNRS, the University of Cologne, the Centro Multidisciplinar de Astrofísica Lisbon and Porto (SIM), and ESO. The team will, for the first time, be able to measure two relativistic effects for a star orbiting a massive black hole — the gravitational redshift and the precession of the pericentre. The redshift arises because light from the star has to move against the strong gravitational field of the massive black hole in order to escape into the Universe. As it does so it loses energy, which manifests as a redshift of the light. The second effect applies to the star’s orbit and leads to a deviation from a perfect ellipse. The orientation of the ellipse rotates by around half a degree in the orbital plane when the star passes close to the black hole. The same effect has been observed for Mercury's orbit around the Sun, where it is about 6500 times weaker per orbit than in the extreme vicinity of the black hole. 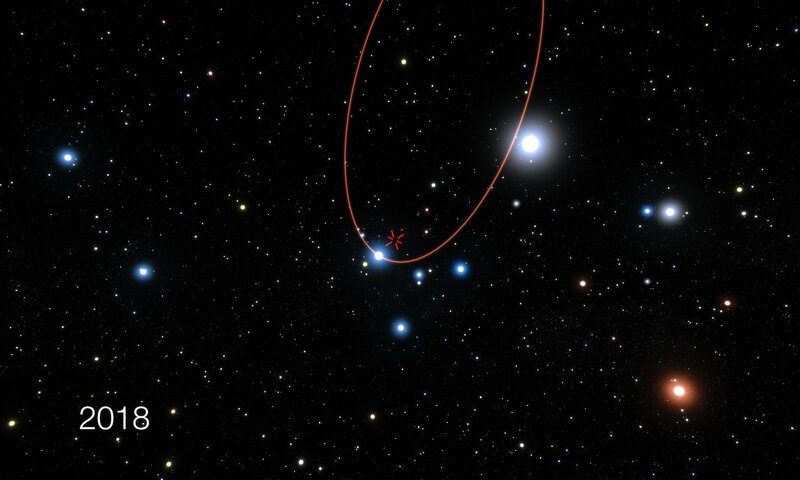 But the larger distance makes it much harder to observe in the Galactic Centre than in the Solar System. ESO is the foremost intergovernmental astronomy organisation in Europe and the world’s most productive ground-based astronomical observatory by far. It is supported by 16 countries: Austria, Belgium, Brazil, the Czech Republic, Denmark, France, Finland, Germany, Italy, the Netherlands, Poland, Portugal, Spain, Sweden, Switzerland and the United Kingdom, along with the host state of Chile. ESO carries out an ambitious programme focused on the design, construction and operation of powerful ground-based observing facilities enabling astronomers to make important scientific discoveries. ESO also plays a leading role in promoting and organising cooperation in astronomical research. ESO operates three unique world-class observing sites in Chile: La Silla, Paranal and Chajnantor. At Paranal, ESO operates the Very Large Telescope, the world’s most advanced visible-light astronomical observatory and two survey telescopes. VISTA works in the infrared and is the world’s largest survey telescope and the VLT Survey Telescope is the largest telescope designed to exclusively survey the skies in visible light. ESO is a major partner in ALMA, the largest astronomical project in existence. And on Cerro Armazones, close to Paranal, ESO is building the 39-metre European Extremely Large Telescope, the E-ELT, which will become “the world’s biggest eye on the sky”.